An often overlooked maintenance task for guitar players is cleaning of the guitar's case. The best way to clean a guitar case depends on the material and construction and can be approached as you would home and auto upholstery. Guitar cases should be cleaned regularly, as mold, mildew, dirt, and odors will inevitably transfer to the instrument. Hard-shell guitar cases are typically covered in textured vinyl, which is tough, durable and semi-porous. Soft cases, or "gig bags," are made of porous nylon, which is the same covering used in soft-sided luggage. Molded hard cases are manufactured from smooth or slightly textured plastic. Specialty cases made of leather, aluminum or other materials are also common. All cases include some sort of soft felt or plush synthetic material for the interior, with plastic or metal hardware for hinges, zippers, and handle attachments. As with any cleaning project, each material requires separate attention. Case materials are common to household and automotive upholstery material, and can be cleaned with readily available cleaners. One exception is vinyl and plastic protectant. These popular protectant liquids won't harm materials they are designed for, but they can make the case slippery and prone to accidents. Guitar case cleaning includes vacuuming the interior, to remove debris and dirt which can damage guitar finishes. Standard household vacuums with hand attachments or portable vacuums can be used. Make sure you are able to get into seams and pockets for best results. Any material cleaning job is best approached by using the mildest cleaner first, followed by increasingly aggressive cleaners as needed. A water-dampened rag is the first step for all materials, followed by a mild solution of gentle dish soap and water. If more cleaning power is needed, household products such as window or surface cleaner can be used on vinyl, plastic and aluminum surfaces, as well as metal hardware. Leather should only be cleaned with leather cleaning products if soap and water aren't enough. Nylon material can be cleaned with spray-on carpet cleaner, and very gently scrubbed with a soft-bristle brush. Identify the materials to be cleaned, and choose cleaners accordingly, never using a "catch-all" cleaning approach. Always follow the directions on the cleaner packaging, and test clean a small, out-of-sight area for compatibility. Case interiors are especially susceptible to odors caused by mold, mildew, smoke and other odors, because cases are usually kept closed. Adding a guitar dehumidifier during humid months, and a humidifier for dry months, is not only good for the case, but is standard practice for protecting your guitar. If odors need to be removed, a light sprinkling of the interior with baking soda, or the insertion of an open box or container, is recommended. Close the case and allow the baking soda to work for a day or more, and vacuum out the powder (or remove the container). The use of odor-neutralizing sprays, such as Febreze, is also effective. 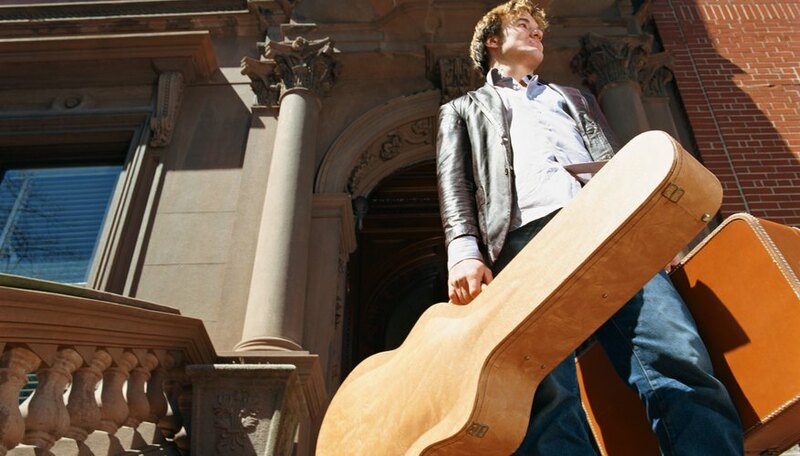 Although the spray will not harm the material, the case should be allowed to dry thoroughly in the sun or heated room to prevent chemicals from contacting the guitar's finish. The best way to clean guitar cases is with a material-conscious, systematic approach. Paper towels or cotton cloths are the best application and scrubbing tools, and scrub brushes and abrasive cleaners should be avoided whenever possible. Many materials have a protective top-coating or finish, which is easily scrubbed off. Be conscious of the condition and placement of your case, and avoid placing it in areas spills and dirt are likely. Removing contaminants as soon as they are noticed is the key to successful removal and cleaning. Can Scratches Be Buffed Out of Gold Watches?